The Volvo Active Driver Assist features the use of radar and camera capabilities enabling emergency braking and assistance in maintaining a safe following distance. With the system the driver receives visual and audible warnings once the vehicle is 3.5 before imminent impact and engages the breaks automatically. Safe following distance, also known as Platooning, is activated when cruise control is engaged. In the case that the the forward vehicle slowed down the driver would be alerted while reducing throttle to the engine, applying the engine break, downshifting the automated manual transmission and applying the brakes and break lights. Transport Topic’s Neil Abt interviewed Paul Savill (America’s Road Team Captain) who shared his feelings toward the Volvo Active Assist system. Paul said that relying on this system to initiate emergency braking felt very unnatural to him; said it went against his years of training and set in driving methods. In response to the autonomous advancements, government agencies NHITSA and SAE are issuing precautionary guidelines for all autonomous vehicles. NHTSA is the National highway Traffic Safety Administration an agency of the Executive Branch of the U.S. government, part of the Department of Transportation. The agency works to reduce vehicle related crashes. SAE is the Society of Automotive Engineers a professional association and standards developing organization for engineering professionals in various industries. 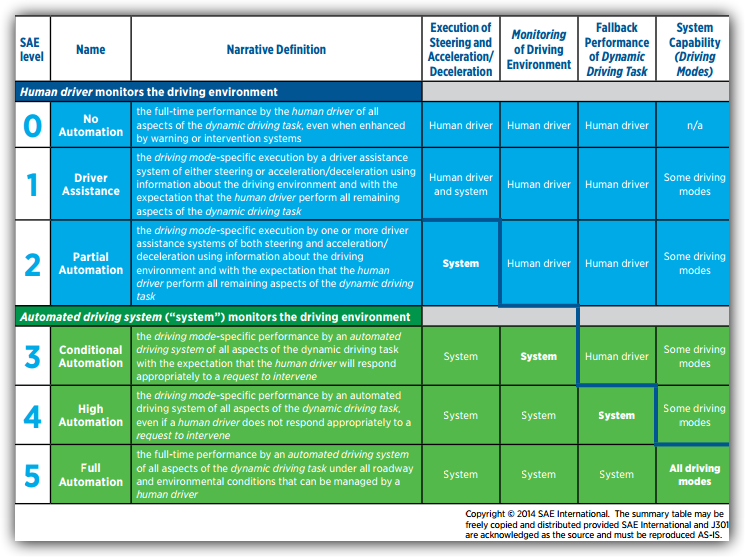 According to these organizations autonomous transportation is divided into 5 levels, summarized in the table below. Level 0 – 2 is considered to be automated, a step closer to automation, the system of operating or controlling a process by highly automatic means, as by electronic devices, reducing human intervention to a minimum. Level 3 – 5 is considered to be autonomous, a system that is navigated and maneuvered by a computer, without a need for human control or intervention under normal road conditions. Autonomous driving is said to pave the way for safer and more efficient driving by removing human error in the driving process. It is estimated that level 4, high automation, will not present until the year 2045. So it will be a long time before we can safely multi-task while driving. NHTSA guidelines for autonomous trucking is set to be released as early as next year. These guidelines will need to be met before any self driving vehicle operates on a public road. Overall the Transport Topic’s webinar team wanted to make clear that driver assistance systems will not replace our truckers. The driver assistance will be used as a tool used to prevent accidents by removing human error from the driving process. Autonomous vehicles will not mean the dissolution of truck drivers; truckers will be present and essential in the transition to autonomous trucking. Join the conversation follow us on Twitter or Facebook and let us know what you think of self-driving trucks.